It's August! We're two-thirds of the way into 2008 and still we wonder how did we get here so quickly?!? We have several announcements for this month so let's get through them! 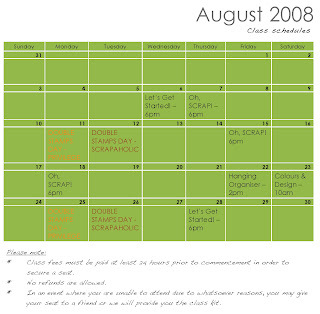 As of 1 August 2008, our business hours on Sundays will be from 11.30am - 6pm. Please take note since we won't like to know that you were eagerly looking forward to come by here after 6pm on a Sunday :) We do apologise for any inconvenience caused. Those wishing to reserve items can still do so but for now, we will only hold items for Privilege members for no more than 24 hours, and Scrapaholic members for no more than 3 days. Again, we apologise for any inconvenience caused. Oh, HAPPY DAYS for HSBC credit card holders! You can now redeem your credit card points for vouchers at Shabby Chic!!! Ain't that awesome!!? Vouchers are now available in B$10, $20 and $50. Lastly, here is our class schedule for August. Oh, SCRAP! - Pressed for time to scrap? This is the right class for you! At the end of two hours, you will create 4 different layouts while learning a few tips and techniques along the way. Complete it at home by simply adding photos and/or if you wish, embellishments! Easy peasy! Fee : B$20 per person. Bring a friend along and pay only B$35 for two! Let's Get Started - What is Scrapbooking? Learn more about it by getting familiar with the tools of the trade, scrapbook jargon and what it takes to create a 12" x 12" layout! Simply bring photos and we'll provide the rest! Colour and Design - Be bold with colours! Learn how the use of colours and the tips and tricks in design that can help create a successful layout - everytime! Hanging Organiser - By popular demand, learn to create and embellish a 12"x12" hanging organiser that's great for home and at work! Don't forget to mark DOUBLE STAMPS DAY on your calendar!!! p.s. MORE new arrivals from the Summer collection to come! Yiipppppppeeeeeee! Does the 'Double stamps day' only applies for the month of August? Is it possible for you to re-order an item that has finished? Oopss!! I didn't watch the calender! It's a great announcement :P hehe~ owkay! Thanks Bev for "Colour and Design" class. I learnt more details in choosing colours and designing a LO.Normally, i would just scraplift from any layouts that i like. I would recomend these class to begginers like myself,it gives a better understanding in choosing colours (in much details)and designing LO guideline. I better ask my frens to join me for the Oh Scrap class! Bev,im joining the oh scrap class on the 18th.Ill be making the payment tommorow.I hope to learn more techniques and practise it more after that hehehe.